Hi, Simon, I have witnessed a few "ISS" flyovers. The last one I saw (2012, iirc) was unusual** - insofar as there were actually two visible flyovers within an hour of each other. The media reported it as unusual which is what prompted me to go outside (twice) to check on it. I literally walked no further than the street outside and, even under the powerful street lights, the "ISS" was still very much visible on both flyovers. The NEAs, by contrast, could never be seen under the same urban conditions; lost to unaided sight because of their much lower light intensity. I appreciate what you're saying but I do still struggle, admittedly as a stargazing rookie, to see what else, other than those differing light intensities, distinguishes the "ISS" from the NEAs. Is there any way you could further clarify (to a rookie) exactly how they differ? Their altitudes above the local horizon, and the apparent speed of motion across the sky of some of the NEAs don't seem very different (at least not to me) to those observed "ISS" flyovers. Could it be a perception issue that low-light intensity NEAs just appear much further away, and maybe they are, comparatively? 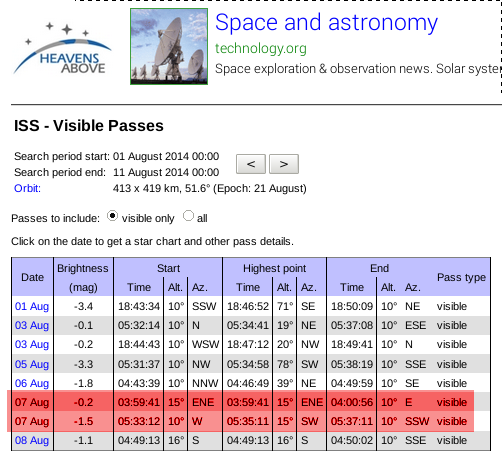 The "ISS" is perhaps still millions of miles away, but closer than all other NEAs by several/many magnitudes? That's the depth of my sincere if amateur observation! How could the double-flyover be achieved using a "decoy" - a conventional high-altitude aircraft? Three possibilities, maybe? (i) use two decoys, the second following in close succession. (ii) turn the decoy round very sharply and fly the same/similar path twice; (would that be disguisable?) or (iii) fly the decoy all the way round the world (which doesn't see feasible in the time available) -- for the 'decoy' to do that in 93 minutes it would have to fly round the world at a speed of ~25,000 km/h. Evil Edna wrote: I appreciate what you're saying but I do still struggle, admittedly as a stargazing rookie, to see what else, other than those differing light intensities, distinguishes the "ISS" from the NEAs. Is there any way you could further clarify (to a rookie) exactly how they differ? Their altitudes above the local horizon, and the apparent speed of motion across the sky of some of the NEAs don't seem very different (at least not to me) to those observed "ISS" flyovers. 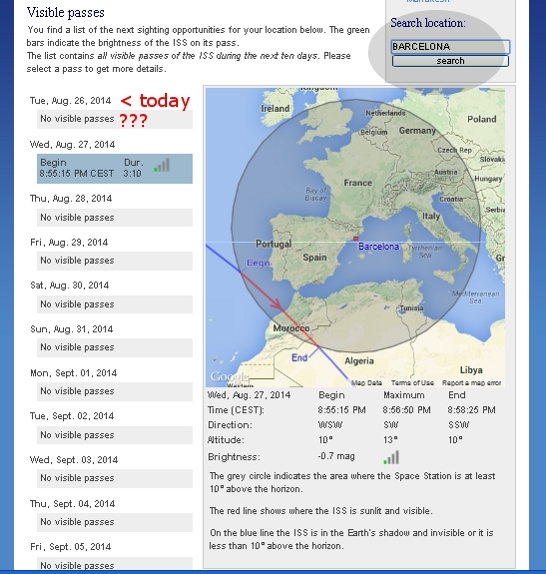 - The "ISS" can actually be clearly seen at twilight (i.e. BEFORE dusk)- coming at you from relatively low elevations (known as "declination" in astronomy terms) - and disappearing 'behind' you, much like a commercial airliner. Back in June (I think June the 21st) this year, I saw it passing over my house at 9:33 pm across a still dark-blue sky, while not a single star was yet visible in the sky. On that occasion, a commercial airplane (with its strobing red and green navigation lights) actually flew by in the opposite direction of the "ISS" - and the two of them crossed their paths right above me. I really wish I'd filmed that, with some top-end camera equipment - to show how the "ISS" looked like just another aircraft flying at a different altitude than that commercial airliner. - The "ISS" shines stronger than any object in the sky - and its brightness (stronger than any other celestial object, including commercial airplane's navigation lights) and its intensity slightly grows and fades - pretty much like airplane lights do. As explained in my above posts, if the "ISS" travels at NASA's claimed speed of 28.000km/h, this would mean that I can see the "ISS" (as it appears and disappears) - from a distance of 1500km. And yes, I suppose NASA would say that the (strong / steady and non-flickering) light it emits is caused by sunlight bouncing off / being reflected by its solar panels. To be sure, no "flood lights" are claimed to be carried by the "ISS". "Appears NW - and disappears NW" ??? How is that possible? Does this mean I would see the "ISS" performing some sort of U-TURN in the sky? Now, If you ask me: "have you personally witnessed any of these "U-TURN FLYOVERS"? Well, unfortunately only once to this day (and ONLY PARTIALLY) - on June 2, 2013. As usual, I was out in my garden looking in the correct, announced direction (ENE) of the "ISS" appearance (and with my clock/stopwatch in my hand). Just as I was about to give up - as the "ISS" was seemingly 'running late' - the "ISS" light suddenly appeared out of nowhere in my East-North-East skyline - and proceeded to fly AWAY from me for 30 seconds or so - before disappearing. In other words, I never saw its announced ENE appearance - only its ENE disappearance. Go figure. I will keep you posted about any future "U-TURN" sightings of mine. But one thing is for sure: the "ISS" is no NEA (Near-Earth Asteroid). simonshack wrote: Just ask yourself this question: WHY would the ISS at times be visible (from my vantage point in Rome) for 1 minute only - and at other times for as many as 6 minutes - if the "Thing" is constantly orbiting at about 330 / 410km of altitude, as claimed by NASA ? if the iss (or whatever) is visible less than ~6 minutes (complete journey from horizon to horizon) it's because the iss is covered in earth's shadow. the iss obviously won't do u-turns. 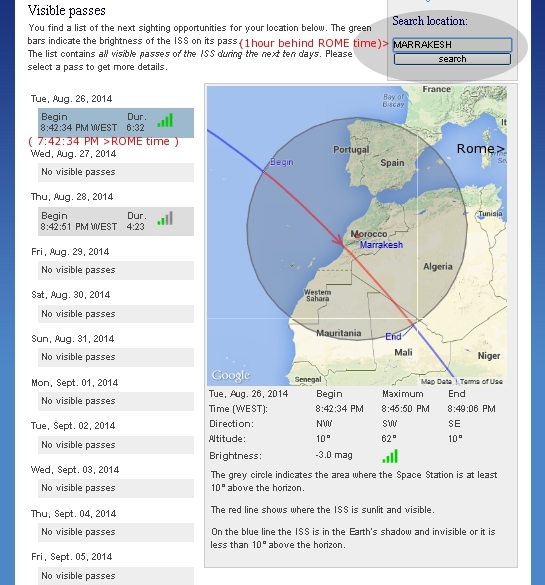 here you can see your viewing radius and whether iss is in earth's shadow (blue line) or visible (red line). if the visibile part is short enough the appearance/disappearance direction will be the same. Now, considering that the "ISS" is supposed to orbit earth once every 93 minutes, and if we are to presume that the above Rome / UK "ISS" passes represented two different / successive orbits of the "thingy", we still have a forty-minute (or so) discrepancy. How can this be explained? Oh well done! You've finally busted the I$$ hoax for me, Simon! You're right: it must be a conventional high-altitude aircraft, doing a scheduled flyover, like some overhead exhibit at an airshow. My mistake in thinking otherwise was assuming the lazy schmucks at NA$A had just commandeered the brightest Near Earth Asteroid (NEA), and renamed it the "I$$". And probably if they'd stuck with that - a relatively simple fraud - to pull off their billion-buck swindle - it would have remained largely undetected. But what with those double flyovers within 93 minutes, and dramatic U-turns in the sky, and - as you've just highlighted, those impossible paths between London and Rome - quite impossible for something supposedly whizzing along at 28,000km/h - at that speed, it's never going to enjoy the turning circle of a mini cooper - the hoax is truly holed below the water line! Before proceeding, and so as to keep the flow of this debate clear for all readers, I would like to hear our German member "tak47"'s opinion about (or even possible explanation of) the above "133 minutes - Rome/ UK" issue. Thanks ! P.S. : english is not my first language but i hope you understand what i mean. That doesn't explain the 40 minutes discrepancy tak47. In 40 minutes it should have traveled to the other side of the earth. Simon, I think Evil Edna didn't give you the data for the UK. He probably didn't enter the location and the data shown were for the location 0°, 0°. That was what happened when I first visited http://www.heavens-above.com. To view this you have to delete the cookies because the site remembers what you entered. (mag.) Tijd Hoogte Azim. Tijd Hoogte Azim. Tijd Hoogte Azim. Yes, I was aware of the sinusoidal / 'serpentine' path (or 'orbit' - as NASA calls it) of the "Thing". Still trying to wrap my head around it - and will have to get back to you about that later. However, as you will see in my first two screenshots below, the "Thing's" path seems to be drifting gradually WEST (not towards EAST, as you stated). simonshack wrote: Yes, I was aware of the sinusoidal / 'serpentine' path (or 'orbit' - as NASA calls it) of the "Thing". Still trying to wrap my head around it - and will have to get back to you about that later. I'm thinking you didn't get to look at my post before making this remark. 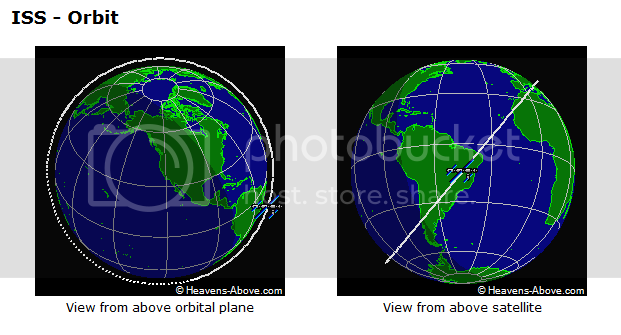 The diagram I posted clearly shows that the (alleged) orbit is not along a latitudinal route, but closer to 45 degrees toward a longitudinal direction, which means the "space"craft is still flying in an orbital (non-zigzag) fashion while the earth turns beneath it. 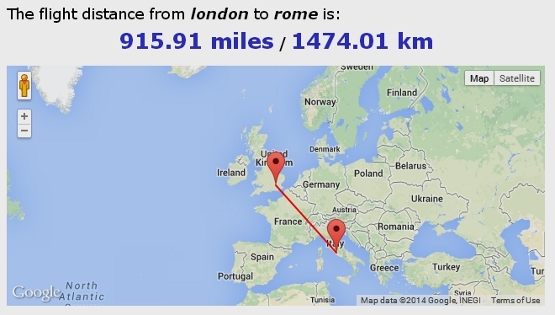 For some reason It is 1 hour earlier in Marrakesh then in Rome, not later as we would expect. 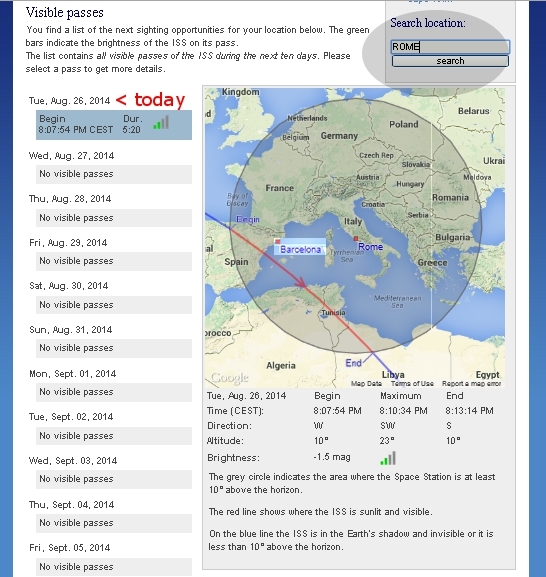 the thing is visible in marrakesh 95 minutes later then in Rome. simonshack wrote: Now, here's where it gets .. well, outright batshit crazy (unless you'll be able to clear this up for me! Surely, I MUST be missing something ???). What on Earth in the Sky is going on here ??? those are two different flyovers. Last edited by tak47 on Tue Aug 26, 2014 1:43 pm, edited 1 time in total. What I'm gathering from looking at my own location data, and clicking "all passes," is that daylight passes are counted as not visible. So your friend won't see the pass of which you speak because there's too much daylight at his location.